ABB has won a $30 million order from ScottishPower Renewables to supply two SVC Light® Static Compensators (STATCOMs) that will smooth out the voltage fluctuations that are an inherent feature of intermittent wind energy. They will increase power transfer capability, improve power quality and enhance grid stability, enabling more energy efficient and reliable power supplies for millions of consumers. The order was booked in the second quarter of 2017. The UK government has set a target to meet 15 percent of its energy needs from renewable sources by 2020. Contributing to this goal, the East Anglia ONE project is expected to provide in total, 714 megawatts (MW) of renewable wind energy from 102 wind turbines to meet the needs of over 500,000 homes. The offshore wind farm is located approximately 43 kilometres (km) off the Suffolk Coast in the southern North Sea. STATCOM is part of ABB’s family of FACTS (Flexible Alternating Current Transmission Systems) technologies that help reduce losses, enhance the capacity and flexibility of power transmission systems and contribute to more efficient and reliable grids. As the technology pioneer and market leader, ABB has delivered more than 800 FACTS installations around the world. Acting as the brain of the STATCOM, is the ABB AbilityTM MACH system which monitors, controls and protects the sophisticated technology in the station, managing thousands of operations to ensure power reliability and efficiency. 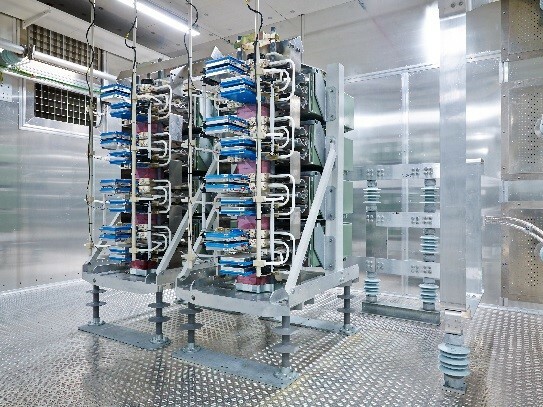 Two advanced ABB TrafoStar™ Autotransformers will be incorporated in the STATCOM system. These compact and low weight transformers are ideal for this type of application as they combine the functionality of two transformers in one, while boosting energy efficiency by significantly reducing the total losses.